A boy finds a penguin who looks sad. Thinking the penguin must be lost, the boy tries to figure out where home is for the penguin. When he learns about the South Pole, he and the penguin set off on an adventure across the ocean. Along the way they become friends. When the reach the South Pole, the boy leaves the penguin on the ice and begins to sail home. But the penguin still looks sad. As he is rowing back, the boy realizes the penguin was never homesick; he was lonely and needed a friend. The boy sails back to the South Pole, hoping he can find the penguin again. This is a sweet story with simple illustrations that complement it perfectly. I love it. I’ve used it in story time with preschoolers and with first graders. 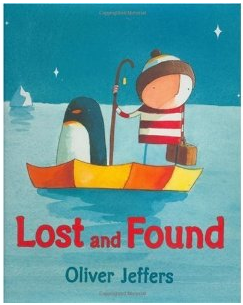 It’s probably a bit too simple for first graders, but I like it a lot, and they get a kick out of the page where the boy and the penguin are accidentally crossing paths on their boats and don’t see each other (I have to point it out to the preschoolers, because they don’t pick up on it in the illustration). And every time I use it in story time, several parents come up to me afterwards to tell me how much they love the book. It really is very sweet. It is followed by another picture book: Up and Down, which I also love. If you liked Lost and Found, you might like Penguin and Pinecone by Salina Yoon.